Westfield resident Joe Bucko and his two sons, Joseph and John, watch Patriots’ practice inside Gillette Stadium on Friday, Aug. 1. 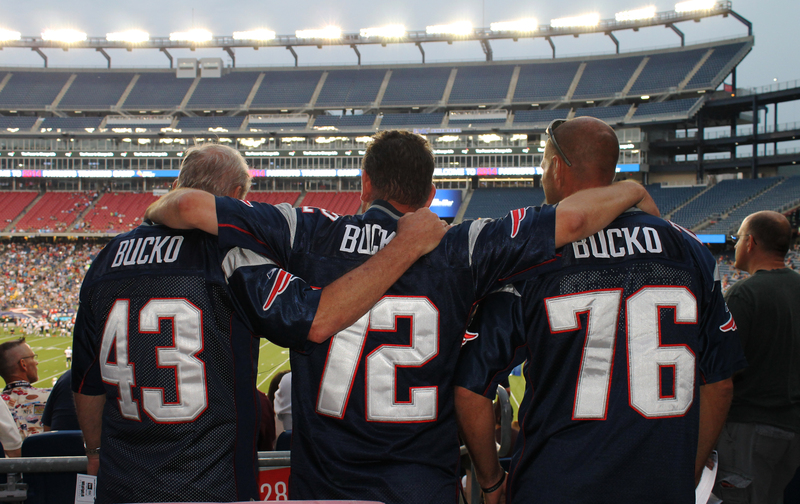 Customized Patriots jerseys are part of the Bucko family tradition when it comes to football season. The jersey number represents the year that person was born – a sign that they were born Patriots fans. New England Patriots’ Annual In-Stadium Practice for season ticket members and local residents attracts 22,886 fans to Gillette Stadium for a free night of football on Friday, Aug. 1. Football was in the air on Friday, Aug. 1, as 22,886 fans united in Foxborough to get a glimpse at the 2014 New England Patriots at the team’s annual in-stadium practice under the lights at Gillette Stadium. Now in its eighth year, the free event provides the Patriots organization an opportunity to show its appreciation for its local communities and loyal fan base. “We started the tradition as an added amenity to thank our season ticket members for their dedication to the team and, as we do as often as we can, we include local residents to thank them for their support as well,” said Dan Murphy, Gillette Stadium’s vice president of external affairs. The team provided complimentary tickets to season ticket members and Foxborough and South Walpole residents to the annual event, which is closed to the general public. Prior to the in-stadium practice, thousands of fans gathered outside The Hall at Patriot Place presented by Raytheon to celebrate the induction of former cornerback and three-time Super Bowl Champion Ty Law into the Patriots Hall of Fame. The ceremony was free and open to the public. 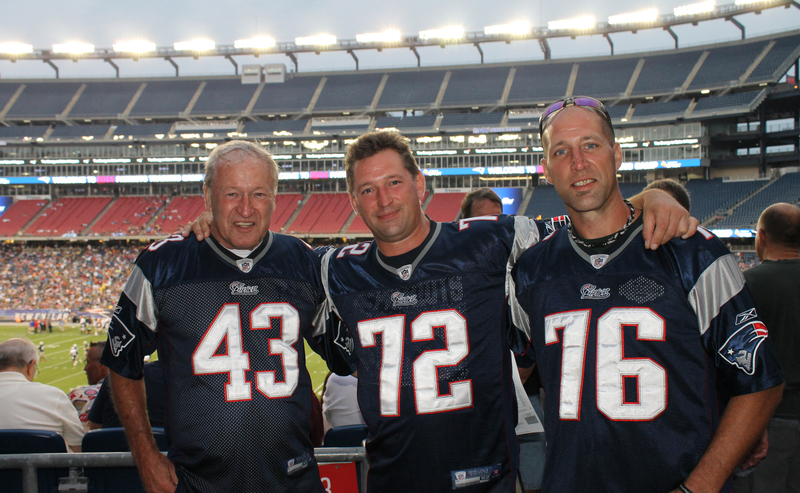 Foxborough resident Daniel Jakes has attended the Patriots’ in-stadium practice every year since its inception because he enjoys the atmosphere around the stadium. Watching practice from seats in the south end zone, Jakes admitted he is sick of summer and ready for football. Gabe Fonseca, of Woburn, agreed. 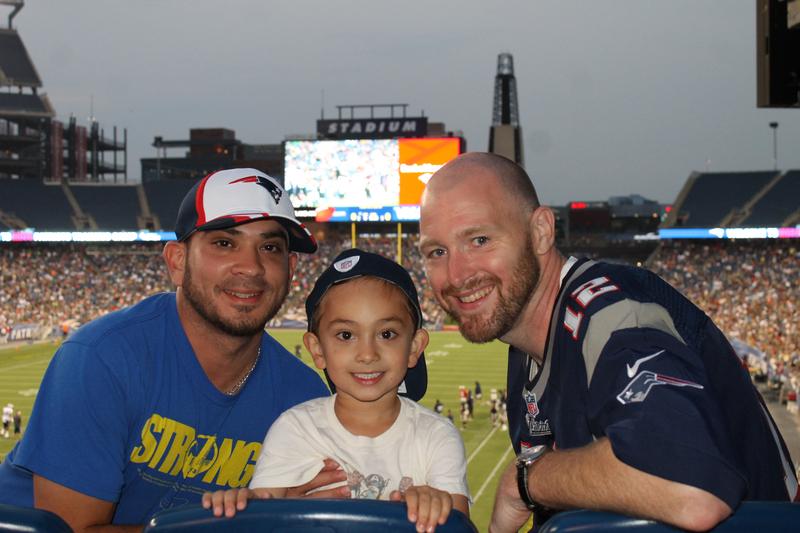 The in-stadium practice was extra special for Fonseca as he was introducing his four-year-old son, Bodhi, to Patriots football and Gillette Stadium. Elsewhere on the main concourse, a father and his two sons explained that Patriots football is something of a family tradition. The Buckos said they liked what they were seeing from the team during the in-stadium practice and are expecting big things this season. For Amanda Rawson, 26, of Dudley, Friday’s in-stadium practice was the first time she’s been at Gillette Stadium to see the Patriots in person. As for the upcoming season, Rawson is looking forward to seeing how the younger players develop this season. After practice, Belichick said he enjoys the environment of the in-stadium event. “Always nice to be out with the fans of Foxborough and our season ticket holders,” Belichick told reporters. “[There’s] a lot of energy in the stadium. I think everybody enjoys the environment. It’s good for us.